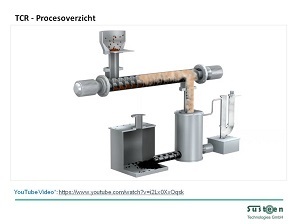 The German start-up Susteen Technologies GmbH will come to the Netherlands with its thermocatalytic reforming process (TCR®), an improved pyrolysis technology. Its customers will locally transform various kinds of biomass into synthesis gas, charcoal and oil of diesel quality, to be used as a fuel or for further processing. This will enable them to use over seventy percent of the energy embodied in the biomass. ‘The unique quality of this TCR® technology is that we can process a variety of side streams to many different products. ‘Multi input and multi output’, in a few words,’ says Hennie Zirkzee, CTO of Susteen Technologies. Related to this is slow pyrolysis. German Pyreg sells equipment that largely transforms biomass to biobased charcoal. Biomass will be processed in the reactor n an interval that vary from several minutes to several hours. This will produce charcoal that can be used as a soil enhancer, as a filter comparable to active charcoal and as a fuel for the production of heat and electricity. The latest development in pyrolysis is thermocatalytic reforming, developed by professor Andreas Hornung, director of Fraunhofer Umsicht. In 2014, Fraunhofer Umsicht created Susteen Technologies as a spin-off to develop this technology. The young company is supported by Fraunhofer Ventures, that manages some 200 spin-offs. The company numbers just four employees, but can call upon Fraunhofer Umsicht in Sulzbach-Rosenberg for support in further development and scaling up. 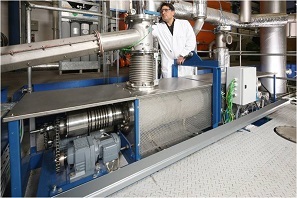 Pre-dried and compacted biomass, containing 70 to 90 percent dry matter, will be fed into the TCR® reactor; at 400 to 500 degrees Celsius, under the exclusion of oxygen, it is processed to catalytically active biobased charcoal (biochar) and volatile organic components, including many organic acids. Coal and volatile components will then be fed into the second chamber of the TCR® reactor, the so-called post reformer. The gases will flow across the bed of active charcoal at 600 to 750 degrees; they are cracked into shorter molecules. The reaction of carbon and water vapour will produce an excess of synthesis gas, about half of which will consist of hydrogen at these temperatures. This hydrogen reduces the oxygen containing organic compounds; this results in an oil mixture with just 7 to 9 percent acids, and a corresponding high calorific value. Hydrogen also reduces the acid components. Upon cooling down, the gases will condense to water and oil. Oils obtained by thermocatalytic reforming can be distilled and then produce fractions that can be used in combustion engines and furnaces and for electricity production. German motor car producers now research to what extent these oil fractions can eventually be used at a large scale as a biofuel. The process also produces synthesis gas, that contains hydrogen, carbon monoxide and carbon dioxide, and methane and other aliphatic hydrocarbons too. Under favourable process conditions, more than half of the synthesis gas will consist of hydrogen. This gas does not contain tar, dust and aerosols and will partly be used for heat production of the process itself. Finally the process will produce biochar, virtually without organic components, and comparable to active coal in porosity. Depending on the feedstock of the TCR®, the calorific value of this charcoal may be in the order of that of anthracite. According to Zirkzee, a major German company has shown interest in this ‘bio anthracite’. Zirkzee: ‘Susteen is in the process of developing and commercialising TCR® systems in various sizes. The TCR 30 is a small device that can process up to 30 kg of biomass per hour. Such a small machine is adequate for farmers who would like to produce sustainable electricity. It can process a great variety of energy-rich side streams. Such a TCR has successfully completed a 3000 hour trial during two years.’ The TCR 300 can process up to 300 kg per hour. Its design and engineering have been completed; the device can be mounted in a container on a skid, it is under construction now. By the end of 2016 it will process sewage sludge somewhere in Germany. And Susteen finally plans to market a TCR 3000, that can process up to 3,000 kg biomass per hour. Biomass meaning: agricultural side streams, household waste, paper waste, manure, digestate, animal oils and fats and plastic waste. Some 80 types of feedstock have been successfully tested. TCRs will not just avoid paying gate fees for waste streams, but will also produce gas, oil and biochar, enabling companies to cover most of their energy demands. This is a shortened version of an article that appeared in Solids Processing, 2016-2.